Many people are expecting some degree of approaching collapse -- be it economic, environmental and/or societal -- thinking that they’ll recognize the danger signs in time. That's not how collapse works. And it's already underway, all around us. However, unlike Hollywood's vision, the early stages of collapse cause people to cling even tighter to the status quo. Instead of panic in the streets, we simply see more of the same -- as those in power do all they can to remain so, while the majority of the public attempts to ignore the growing problems for as long as it possibly can. But most of the majority won't get started until it’s entirely too late to make any difference at all. Which is sad but perhaps unavoidable, given human nature. Our view is that collapse of our current way of life is happening right now. The signs are all around us. Our invitation is for you to notice them and inquire critically what the ramifications will be -- irrespective of whatever pablum our leaders and media are currently spewing. While the monetary and financial elites strain to crank out one more day/week/month/year of “market stability”, the ecosystems we depend on for life are vanishing. It's as if the Rapture were happening, but it's the insects, plants and animals ascending to heaven instead of we humans. 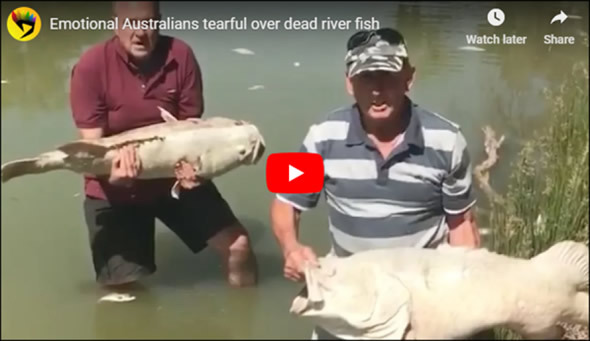 Watching the video above showing grown men crying over the loss of 100-year-old fish is heartbreaking. This fish kill is described as “unprecedented” and as an “extinction level event", meaning it left no survivors over a long stretch of waterway. We can try to console ourselves that maybe this was just a singular event, a cluster of bad juju and worse waterway management that combined to give us this horror -- but it wasn’t. "It raises concerns as to the fate of other creatures who have more secretive, secluded lifestyles," Dr Welbergen says. He sees the bats as the "the canary in the coal mine for climate change". A two-day heatwave last November (2018) was sufficient to kill up to a third of all Australia's known flying foxes, a vulnerable species that was already endangered. As those bats are well-studied and their deaths quite conspicuous to observers, it raises the important question: How many other less-scrutinized species are dying off at the same time? Last summer was a time of extreme drought and heat for Australia, and this summer looks set to be even worse. This may be the country's 'new normal' for if the situation is due to climate change instead of just an ordinary (if punishing) hot cycle. People are rallying to try and save the kauri trees, although it’s unclear exactly how to stop the spread of the new fungal invader or why it's so pathogenic all of a sudden. 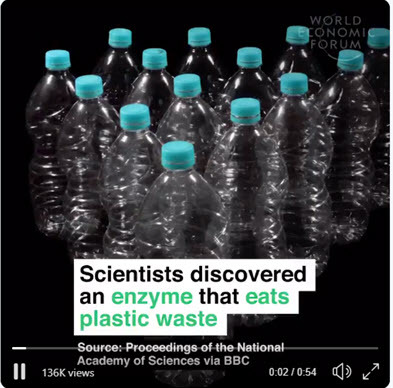 It could be due to another natural sort of cycle (except the fungus was thought to have been introduced and spread by human activity) or it could be another collapse indicator we need to finally hear and heed. 2,000-year-old baobab trees in Africa are suddenly and rather mysteriously giving up the ghost. These trees survived happily for 2,000 years and now all of a sudden they're dying. Are the deaths of our most ancient trees all across the globe some sort of natural process? Or is there a different culprit we need to recognize? In Japan they're lamenting record low squid catches. Oh well, maybe it’s just overfishing? Or could it be another message we need to heed? To all this we can add the numerous scientific articles now decrying the 'insect Apocalypse' unfolding across the northern hemisphere. The Guardian recently issued this warning: “Insect collapse: ‘We are destroying our life support systems’”. Researchers in Puerto Rico's forest preserves recorded a 98% decline in insect mass over 35 years. Does a 98% decline have a natural explanation? Or is something bigger going on? CAMARILLO, Calif. – The number of monarch butterflies turning up at California's overwintering sites has dropped by about 86 percent compared to only a year ago, according to the Xerces Society, which organizes a yearly count of the iconic creatures. Note the “explanation” given blames the decline on mostly natural processes: late storms, droughts and wildfires. I believe that's because the article appears in a US paper, so no mention was permitted of neonicotinoid pesticides or glyphosate. Both of these are highly effective decimators of insect life -- but they're highly profitable for Big Ag, so for now, any criticism is not allowed. This is something I’ve noticed directly and commented n during my annual pilgrimages to the northern Maine coast over the past 30 years, where seagulls used to be extremely common and are now practically gone. Seagulls! How does one lose seagulls? Next thing you know, some other major food chain will be wiped out and we'll get oceans full of jellyfish instead of actual fish. Or perhaps some once-benign mold grows unchecked because the former complex food web holding it in balance has collapsed, suddenly transforming Big Ag's "green revolution" into grayish-brown spore-ridden dust. MANY OF THE world's amphibians are staring down an existential threat: an ancient skin-eating fungus that can wipe out entire forests' worth of frogs in a flash. After all, we can’t even manage our watersheds properly. And those are dead simple by comparison. Water falls from the sky in (Mostly) predictable volume and you then distribute somewhat less than that total each year. Linear and simple in comparison to trying to unravel the many factors underlying a specie's collapse. For the last six months Arizona's water leaders have been experiencing the third stage of grief: anger and bargaining. Of the seven U.S. states that rely on the Colorado River, Arizona has had the hardest time figuring out how to rein in water use and avoid seeing the river's largest reservoirs — Lakes Mead and Powell — drop to extremely low levels. Kathryn Sorenson, director of Phoenix's water utility, characterized the process this way: "Interesting. Complicated. Some might say difficult." The county's biggest grower of cotton and alfalfa, Brian Rhodes, is trying to make sure that doesn't happen. The soil in his fields is powder-like, bursting into tiny brown clouds with each step. "We're going to have to take large cuts," Rhodes said. "We all understand that." Oh my goodness. If we’re having trouble realizing that wasting precious water from the Colorado River to grow cotton is a bad idea, then there’s just no hope at all that we'll successfully rally to address the loss of ocean phytoplankton. That’s about the easiest connection of dots that could ever be made. As Sam Kinison, the 1980’s comedian might have yelled – IT’S A DESERT!! YOU’RE TRYING TO GROW WATER-INTENSIVE CROPS IN THE FREAKING DESERT! CAN’T YOU SEE ALL THE SAND AROUND YOU?!? THAT MEANS "DON’T GROW COTTON HERE!!" I know that the mainstream news has relegated this conversation to the back pages (when they covered it at all) and so it's not “front and center” for most people. But it should be. At the same time, we're in the grips of an extremely dangerous delusion that has placed money, finance and the economy at the top spot on our temple of daily worship. Any idea of slowing down or stopping economic growth is “bad for business” and dismissed out of hand as “not practical”, "undesirable" or "unwise". It’s always a bad time to discuss the end of economic growth, apparently. But as today's young people are increasingly discovering, if "conducting business" is just a lame rationale for failed stewardship of our lands and oceans, then it’s a broken idea. One not worth preserving in its current form. The parade of terrible ecological breakdowns provided above is there for all willing to see it. Are you willing? Each failing ecosystem is screaming at us in urgent, strident tones that we’ve gone too far in our quest for "more". And don't expect the cavalry to arrive. Sadly, this is exactly the sort of inane distraction most admired by the Davos set in large part because it helps them feel a tiny bit better about their ill-gotten wealth. "Look! We're supporting good things!" The ugly truth is that big wealth's main pursuit is to distort political processes and rules to assure they get to keep it and even amass more. 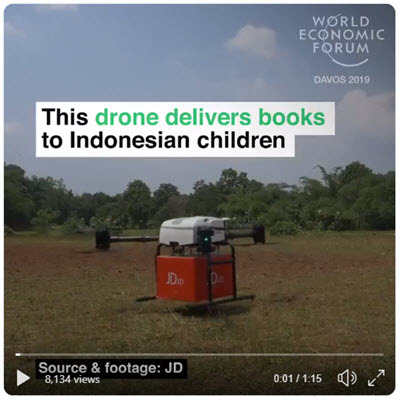 Drones carrying books to Indonesian children provides the same sort of dopamine rush to a Davos attendee as Facebook 'like' gives to a 14-year-old. Temporary, cheap, superficial and ultimately meaningless. In virtually every instance, the Davos crowd wants to preserve industry and our consumer culture as it is, using technology and gimmicks in attempt to remedy the ills that result. There’s money to be made on both ends of that story. The only thing that approach lacks is a future. Because it’s not-so-subtly based on continued "growth". Infinite exponential growth. The exact same growth that is killing ancient trees, sea birds, insects, amphibians, and phytoplankton. In other words, don’t hold out any hope that the Davos set representing the so-called “elite” from every prominent nation on earth are going to somehow bravely offer up real insights on our massive predicaments and solutions to our looming problems. They're too consumed with their own egos and busy preening for prominence to notice the danger or care. In other words, if you held out any hope that “they” would somehow rally to the cause you’d best set that completely aside. It's no wonder social anger against tone-deaf and plundering elites is breaking out right now. Thank you for your reply. I'm under no illusions about "benevolent dictatorships," honest. The problem is the existing political system shows no evidence of rising to the challenge, for at least two reasons, and something different needs to be attempted, no matter how uncomfortable. Reason #1: It's not a democracy anyway. Any political system where consultants can talk intelligently about where to put their advertising buys in order to alter the vote percentage is a system that doesn't rely on the informed public, but on the successful short-term alteration of public opinion. It's a system that values celebrity and wealth, because those are the two gates to short-term changes of public opinion. Do I need to provide you with examples of how long-term public opinion is not reflected in America's government -- no, of course not. Capitalism and genuine democracy are only compatible until someone has more wealth or celebrity than someone else; that is, for, possibly, up to a week. Well-regulated capitalism might allow a democracy to survive for longer, but eventually the wealth differential rises and someone buys the regulators. Reason #2: Democracies do not represent the vast majority of sentient beings. The suffering of non-citizens is just an "externality." The suffering of animals: externality. The trashing of what future generations will need: yes, externality. I fully agree that a solution requires a change in cultural norms, because a solution requires that most people behave in ways fundamentally different than the self-centered ways that most of us behave, most of the time. My question is, will we get those changed norms without changing our political system in ways we will all find unpalatable. I assume you and I agree that if the cultural norms change by 2200, that does our descendants little good, because the planet's ecological web will already have been thoroughly altered in ways that make it less able to support billions of human beings in satisfying lives. So if we don't have seven generations to come around to egoless wisdom in our own behavior and in the behavior of those we elect, we need something that brings about more rapid change in the effects we are having on the planet. I'm aware that change for the better can be rapid -- as a gay man I've seen gays go from Alan Turing pariahs to near-equal citizenship in two generations. But that is not a change in selfish behavior, it is a willingness to enlarge the circle of fungible money sources. Many conservatives of two generations ago had gay friends but would still vote against gay rights. It was no sacrifice on their part to accept gays into the charmed circle; quite the opposite. The gay community, especially that of gay men, having been deemed immoral by so many, had presented an extraordinarily materialistic public face to society -- welcoming our money and capability was the opposite of sacrifice to the corporations who wished to sell to us and make use of our abilities. A better example of the time it takes for change is the way America has treated the descendants of its slaves, and those who share their skin color. The system is still incredibly, fundamentally racist. If you are wealthy and black, you may do just fine in American business, but you may still be shot by police for trying to enter your home in a "white neighborhood," especially if you'd been jogging and not wearing a business suit uniform. That's more than a dozen generations after slavery was delegitimized in America. I think it pays to examine the difference between those two examples -- in one case, people could hide and become wealthy (visible to the system), while in the other, skin color was a dead giveaway and the accumulation of wealth by those outside the circle remained much harder. The rapidity of the change was determined not by moral reasons but by whether the change brought more money into the system; that is, by the selfishness of those already inside. I've been the opposite of a "military man" all my life -- I do not think highly of a system that I think was characterized quite well by the Marine Corps General Smedley Butler in his book "War is a Racket." But I know of only one part of our society with the ability to mobilize vast resources quickly without being encumbered by the need to convince a majority, and that is the military. All my life, I've heard the cliche that "democracy is the least bad system." In my opinion, events have overtaken that cliche. Whatever we have that we call democracy has proven to be far from the least bad system; it is the system that has already destroyed much of our wealth of biological diversity, celebrating its goodness while doing so. Our democratic system has known of the crisis for two generations, and would have taken action, perhaps, if it weren't run by and for the oil companies, the rest of the wealthy, and their hired hands. It is time for some Platonic Guardians With Bombs; they don't need to remain uncorrupted for long, just for long enough to dismantle the disaster of a system that so many of us still celebrate, just as the crowd celebrated the Emperor's New Clothes. If the Platonic Guardians turn into corrupt plutocrats, ok, fine, they can be the new set to fight against. But the norms will have changed and, hopefully, the power of fossil fuel wealth will have been broken. If there is a good logical argument why what I'm saying is untrue, nobody would be happier to hear it than I would. I have the utmost respect for your analysis and contributions. Thank you for them. The thing is, even if you demonstrate, scientifically, that the greenhouse effect is bogus, you can’t ignore the fact that we are TRASHING our one and only planet and the consequences are piling up at an unimaginable pace. Cause not withstanding, my neck of the woods, Wisconsin, has warmed considerably, the last 35 years. The hardiness zones in Southern Wisconsin have moved North 150 miles, so far. I see no point in continuing. You seem to be in a teaching frame of mind, not a learning mode. I noticed you haven’t posted here much in the past. Perhaps you are unaware that this topic has been debated adnausium since it was first broached on this website. Many here have tired of the debate and moved on. This topic has been debated to exhaustion in The Definitive Climate Change thread, but Old Guy is right that there is nothing but models to suggest that more than half of the warming of the last century was caused by humans, or that anything worse should be expected for the rest of this one. Anyone with the science knowledge and skills to read and understand the scientific literature should know that there is zero evidence to link extreme weather events to anthropogenic global warming. Even the UN IPCC disavows this. That is why it is so disappointing to me that Chris is so quick to sound alarms based on weather events. It would be much more honest, and in the long term, more effective for him to continue to sound the alarms over the chemical catastrophe that is being driven by our debt based currency system. Choosing to use the wrong information to support a correct cause sometimes backfires. People can throw your cause baby out with your wrong information bath water. Stan, there you go again. I have not linked any particualr thing to any other thing except that I have opened the question, which should be studied, as to if perhaps the acidification of the ocean (due to rpaidly rising CO2 levels) is somehow linked to phytoplankton losses. The graph I supplied has a very compelling correlation to observe. Is there causation linked there? Seems possible to me, epsceially given what we know about the effects of oceanic acid/base levels and the formation of calciferous shells that many ocean micro life forms depend upon. Otherwise I made note that once is an accident. Twice is a coincidence, but three times is enemy action. That's not flying in the face of science as we know it, but is the very root of observational intelligence. Now Old Guy represents himself as an authority on many things but I will have to dispute his authority on Australin weather events. In January 2008, Alice Springs in Australia's Northern Territory recorded ten consecutive days of temperatures above 40 °C (104 °F) with the average temperature for that month being 39.8 °C (103.6 °F). In March 2008, Adelaide, South Australia experienced maximum temperatures of above 35 °C (95 °F) for fifteen consecutive days, seven days more than the previous longest stretch of 35 °C (95 °F) days. The March 2008 heat wave also included eleven consecutive days above 38 °C (100 °F). The heat wave was especially notable because it occurred in March, an autumn month, in which Adelaide averages only 2.3 days above 35 °C (95 °F). The Australian summer of 2012–2013, known as the Angry Summer or Extreme Summer, resulted in 123 weather records being broken over a 90-day period, including the hottest day ever recorded for Australia as a whole, the hottest January on record, the hottest summer average on record, and a record seven days in row when the whole continent averaged above 39 °C (102 °F). Single-day temperature record were broken in dozens of towns and cities, as well as single-day rainfall records, and several rivers flooded to new record highs. From 28 December 2012 through at least 9 January 2013 Australia has faced its most severe heatwave in over 80 years, with a large portion of the nation recording high temperature reading above 40 °C to 45 °C or greater in some areas, a couple spots have also neared 50 °C (122 °F). This extreme heat has also resulted in a 'flash' drought across southern and central areas of the country and has sparked several massive wildfires due to periodic high winds. In February 2017, Australia experienced an extreme heat wave with temperatures as high as 46.6 °C (115.9 °F) in Port Macquarie, New South Wales and 47.6 °C (117.7 °F) in Ivanhoe, New South Wales. 2018 - 2019 Australian heat wave. From December 25, 2018, Australia was plunged with constant record-breaking heatwaves with few breaks. December 2018 was recorded as the hottest December in record, while New South Wales had their warmest January since 2011. Adelaide recorded its hottest day on record on January 24, surpassing the previous record from 1939, reaching 46.6 °C (115.9 °F) at 3:36pm local time, and many settlements across South Australia set new records the same day. At least one man, 90 feral horses and 2,000 bats died, while 25,000 homes lost power. Melbourne was forecast its hottest day since the 2009 Black Saturday bushfires on January 25 (although this failed to eventuate), while over 200,000 homes across Victoria lost power due to load shedding. The way my brain works, I look at this data for Australia and I observe that 4 of the most extreme heatwaves, including the most intense ever, occurred in the last ten years after 150 years of record keeping. Hmmmm. Could all be a big coincidence, right? Sometimes dice jsut come up sake eyes 4 times in a row, and we don't wonder if something about the dice has changed because the simplest, most likely scientific explanation is that a profoundly unlikely string of occurances is that it's all random? But what about 40,000 years of glacial records in the arctic? Glaciers are simple beasts. If the summer temperatures are warmer than average they retreat, if colder they advance. How many coicidences should we be willing to tolerate? When do we say "hey, maybe there's something happening here?" After a dozen more? Two dozen? I could pull up a hundred other such data points. They seem to coalesce around the theory of "things being warmer." What's your preferred approach to all this? Wait and see? And how to you dismiss ocean acidification which is pretty much linear. Boyle's gas law plus some Chem 101 gets you there. We may be trashing our planet but it has nothing to do with CO2. It means that if we make that the focal point of policies we are not solving problems but wasting resources without making progress but actually making things worse. To spend hundreds of billions, soon to be in the trillions in a false pursuit for a goal that can't be achieved is destructive behavior. As far as the hardiness zone in Wisconsin moving north, do you know that for most of the last 11 thousand years the tree-line in Canada and Russia was much further north than presently and that tree-lines were substantially higher in elevation on mountains than now. Or that at the edge of currently retreating glaciers there are large tree stumps being exposed that date to 1,000 years ago or even 2,000 years ago that show there were forests growing where in modern times there has only been ice. Despite the propaganda of the warmists we have actually been living in a time of unusual climate stability the last hundred years. In this interglacial, the Sahara desert was once a forest with lush vegetation and flowing rivers. Then weather patterns shifted and it quickly became a desert. In the Middle East and in the western US civilizations have gone exstinct from sudden climate shifts. We have seen nothing like that recently. Kids now are propagandized from grade school to view every weather event as being unusual and ominous when in fact it has all happened before and is not unprecedented. Recent flooding in California was suppossedly caused by man-made climate change, but in 1860 there was a flood that had the entiire central valley 300 miles north-south and 50 miles across under up to 20 feet of water. And that was before the land in the valley subsided by several feet due to water extraction from the underlying aquifer for irrigation. And then when there was recently a multi-year drought in California it was blamed on global warming but several centuries ago there was a drought in California that lasted for over 200 years. The climate in recent decades has been incredibly benign and in fact a temperature increase of a couple of celsius degrees and an increase in growing seasons and northward expansion od agriculture and increased growth rates from CO2 would be a great thing and a boon to humanity and wildlife. I could go on much longer but you get the drift. As for being in a teaching mood, I am simply stating what I know. As for learning, I have listened to the warmists and they are not very persuasive with factual arguments. They make a lot of stuff up that is quickly dismantled because it is not factually based, but basically their technique is endless repetition of dogma and attempts to close out counter arguments and real debates, as well as name-calling and demonization as a weapon. And yes, you are right. Debate with people who have succumbed to the propaganda is largely fruitless. Facts and logic don't penetrate people who have a religious-like devotion to a cause or belief system. The temperature data record has been tampered with and adjusted to such a degree that it is unfit for use.The warmists in government agencies have used all sorts of tricks to distort the record and create an exagerated warming. They do this because their fundamental science is weak and so they despeately need the temperature record to validate them. A hundred years ago there were no thermometers over most of the earth so that allows for a huge fudge factor for setting up a base-line temperature as they can just make up or estimate temps to go into the baseline. They have no precise knowledge at all of what ocean temps were a hundred years ago. Distortions have been created because thermometers that once were in open fields are now surrounded by buildings and ashphalt as cities have grown around them. They used to record temps once a day for the high and once for the low. Now digital thermometers record constantly and record for the high a puff of warm air that came by at whatever time. It has been estimated that this alone has increased temp recordings by .3C degrees. Several years ago they dropped hundreds of thermometers from the recording system and this again immediately raised average temperature as all of the thermometers in cities and airports were kept and mostly rural ones dropped. There is also a fudge factor with temps in that they are estimated for certain areas of the globe or "homogenized" to a thermometer up to 1200 kilometers away and you know in which direction warmists will fudge. Recently it was shown that large areas of the globe that were recorded as substantially above normal last year actually had not a single temp recording station in the area. And then there is just the blatant altering and adjustments of temps without disclosing methodologies and giving flimsy rationals. if I follow your train of thought correctly, you are saying that warming causes more CO2 in the atmosphere and not the other way around. That extra CO2 comes largely from the oceans which are the main reservoirs of CO2 as warming waters hold less CO2. Correct me if I'm wrong up to now. That begs the question, in your worldview, how do you account for the acidification of oceans (which seems to be a fact)? According to your model, less CO2 in the ocean due to warmer tempetures = less acidic oceans, or shouldn't it be so? Get real old guy. The thermometers are in the glacier and ocean sediment cores, and they extend back for hundreds of thousands of years. Those temperature distortions of yours are in your personal belief system and/or are part of the “doubt is our product” industry. Please paste a link to REAL peer reviewed studies that demonstrates your point. Maybe I should paste a link to copies of internal oil company documents written in the 70s that say global warming is real and a threat to life on this planet. They parallel similar tobacco industry documents from the 50s. Those documents were not voluntarily released. I wonder why. Please try to understand the word "average." If you are looking for absolute proofs of climate change you better stop looking. Proofs only exist in theoretical mathematics. Everything else in science are probabilities. The more coincidences there are, the higher the probability that there’s a connection. The vast majority of them point to a warming planet. For example, there was a study of the Yukon glaciers a while back. Of the 300 or so studied, 4 increased in size, 12 totally disappeared, and the rest reduced in size. The denialists' conclusion: The glaciers are increasing. Similarly, the shrinking temperature differential between the poles and the equator is destabilizing the jet stream, causing wilder fluctuations. This will occasionally bring short term arctic blasts to warmer regions. The denialists conclusion: Global warming is fiction. Of course, they ignore the long term "average" warming that's occurring in every region of this planet. The “average” temperature is the only thing that matters here since there is so much inertia in the climate system. The effects of the CO2 we are pumping out now will not be seen for 40 years. Children are being propagandized? Who has the money to fund this massive “incubator baby” propaganda machine? The climate scientists’ grant money would only pay for a few seconds of it. There are a couple of passages in Hitler’s Mein Kampf where he talks about how the American and English WW1 propaganda was far superior to that of the Germans. Of course, the Nazis made massive advances in it during WW2, but the stuff we are flooded with today would probably make Hitler blush. At the risk of being thought to be older than Old Guy, I will see your south Australia and raise you the dust bowl years in Oklahoma. I live through the last part of these. It was hotter, longer and drier that south Australia of recent years. The 30s, 40s and 50s were miserable here. The records of temperatures and heat waves from those times still stand. Nothing like those conditions have been seen again. A recurrence of similar conditions these days would surely be cited as evidence for anthropogenic climate change. But the 30s were times when the CO2 in the atmosphere was barely above the pre-industrial levels. Humans had nothing to do with it aside from some poor soil conservation practices. I still think that you would make a stronger case if you didn't stoke weather fears among the youngsters. Just my $0.02. What they need to concentrate on is the death of the insects. Car windshields have never been so clean around here and the ill informed public seems to think that to be a good thing. His essay is full of words about systems but he doesn't seem to understand the basics of systems, feedback, stability and limits. Possibility B: The deniers are right, it's all an elaborate plot to over-tax us and lead us to one-world government. Well, the observable action by governments is that they talk a lot about climate change and do absolutely nothing, or at least nothing effective. So, even if A is wrong, the evidence says that B is not happening in any way that is a significant threat. But IMO, all the discussions on Peak Prosperity reveal that the unfolding collapse is much broader than just climate issues. Remove climate from the framing, and civilization is still facing the sharp "up" part of multiple exponential curves, all bad. A climate debate based on the "do something" vs. "don't do anything" (or other variations) no longer feels meaningful. We're now in adaptation mode to deal with many coming problems. I personally think climate is one of them, but even if it's not, there's still going to be hell to pay. I read some work by Dr. Jack Kruse a while back. His contention is that evolution is not a gradual process as most think of it today. He thinks there are periods of rapid change in the environment during which most biological evolutionary changes occur. The last such period was when an asteroid struck the Earth near the Gulf of Mexico. According to him, at that time lots of rapid evolution took place among plants and animals. The hopeful part me thinks maybe the Divine Order is gearing up for another such period. The pesimistic part of me thinks the powers that be are not blind to these issues & their only solution is massive population reduction. Since I can't seem to paste graphs into the box take a look at the graphs on this page derived from ice core data that present a good perspective on where we are with present temps relative to the rest of the present interglacial. louisdoran, ocean acidification is not happening. A link below. Could post others. Alright Jean, I can see that the discussion is getting tiresome. So maybe we should stop talking about actual climate and temps. But there is something that stems from the climate change agenda that also speaks to your point and is contributing greatly to our economic decline. That is the hundreds of billions that have already been spent and continue to be spent as a result of government policies and mandates based on the CO2 causes climate change assumptions. I am talking of the attempted move into renewable energy and the money spent directly and via taxpayer subsidies toward that end. I assert that this is pure folly, has no hope of succeeding, is actually environmentally destructive, would cost trillions, raise electricity prices many times over, provide thoroughly unreliable energy and result in energy grid instability to the point of collapse long before 100% saturation is achieved. And would dramatically lower living standards and general human welfare. But rather than elaborate further I'll just post this link that explains some of it well. Renewable(green) energy is just not what the starry-eyed believers think it is. In fact, it is a horrible idea. First, I believe that government policies tend to create problems, not solve them. In general, I believe that most elected officials are clueless about what is really going on about anything. Global warming is a decades old debate. Do you somehow believe that anyone who is seriously interested in the topic hasn't done enough personal digging to form solid opinions that you are unlikely to change? Do you honestly believe that you are going to say something new, or say it better than it has ever been said before and therby get a significant group of people to change their beliefs? Chris wrote an excellent article on broader environmental issues. I am discouraged to see someone significantly detract from that. Recall that one of my acquaintances in Canberra is a meteorologist, employed by the Australian Bureau of Meteorolgy (BoM). He's retired now but still alert and active, currently teaching at a technical college, and definitely didn't leave his brains behind at the departure desk. Here's what he told me (emphasis mine throughout). Such people are amazing and very selective in their data interpretation. He obviously ignored the very important caveat BoM placed on the data in the bottom left corner. This data has not been quality controlled and before 1910 who knows how the temperature was measured and how dodgy the thermometers were. The same rigorous analysis procedures (co-ordinated by the World Meteorological Organization) have been carried out on the various global data sets managed by the meteorological services of other countries. The other problem with the data used is that any scientist worth his salt would take one look at that data set and know that there is something seriously wrong with the data before 1910, or something extremely weird is happening to the weather during that period which would have to be explained and correlated with other observations around Australia (or the world). Until that had been explained you wouldn't use the data. The other thing climate change deniers seem to forget is that climate change is a global phenomenon and shows up very clearly in global data sets. Cherry picking by choosing a particular observation site and only looking at that site doesn't really tell us anything about what is happening globally. I usually don't engage with climate deniers as it is a complete waste of time. I can vouch from my nigh-on 70 years of residence in Australia that extreme temperatures are normal and to be expected in many parts of the country. Look up the records for Marble Bar, for instance, and you'll see what I mean. I was told recently that the punishing weather that Canberra has had for the past 2–3 weeks is normal in Port Pirie (q.v.). The big deal that it has extended to the "cool, temperate" south-east and is destroying ecosystems as a result. Our backyard garden has been damaged, even though we tried to keep the water up to the veggies. Even cool, wet Tasmania has been suffering badly from bushfires in once-beautiful places. We were so fortunate to have visited the burnt areas a few years ago and to have seen them before they turned to charcoal and ash. Like Chris and others I am in a state of constant mourning amd grief over the perverse way in which we treat our planet. Nothing is sacred, nothing is beautiful, no damage is too great, we must hurtle into the abyss as rapidly as possible. Honestly, it's psychopaths all the way down. Les, there is nothing stopping you or anyone else from commenting on any aspect of the article you care to and creating a different line of discussion. My experience has been that most people who have an opinion on the climate issue have no idea what the actual facts are. They are aware of the notion that CO2 is supposed to trap heat but that's it. For people on the political left it is de rigueur that they believe in it period and a litmus test for being a true leftist. Many on the right take an opposite stance just because of this. But most disbelievers can't make a case to support the belief either. Yes, I won't change most minds, but there may be some fence sitters or people with tentative beliefs who are open to information. Probably also some who are skeptical but haven't looked deeply into the issue and can use some reinforcing. So I'm not going to make a difference. People have written well researched books on the topic and have not made any difference. But they wrote them anyway. I would suggest buy or grow more food that you can properly store away for long term food storage. When you think you have enough for your family for a year, double it. Then double it again. Then again. Etc. There are plenty of resources out there to learn how to properly store food and other necessities. Whatever happens and whoever is right on these arguments one thing is apparent, you will need to eat. Food rs really cheap today. Tomorrow maybe not so much after a worldwide crop failure. Wish I had better advice but I don't. Good luck and I pray God will bless all of us. "Also, for some years I have been pointing-out that there is no consistency in the methods used by the Australian Bureau of Meteorology to measure surface temperatures, and that the routine remodeling of temperature series by the ACORN-SAT unit within the Bureau is not scientific. 1. I’ve provided details in letters to various Ministers, including, for example, this letter sent to Simon Birmingham in 2014. 2. I’ve also sent letters to Auditors and Chief Scientists, for example, this letter sent to Alan Finkel in 2018. 3. I’ve also published my concerns in popular magazines, including this article, published by The Spectator online in 2017. I’ve no doubt that one day there will be a proper enquiry, and my efforts will be vindicated. In the meantime, no one in a position of authority is willing to acknowledge the extent of the problem or its implications. We have a long history in Australia of ignoring such evidence, and then holding Royal Commissions at which everyone shakes their heads and suggests that it was appalling the abuse – that was allowed to happen for so long despite all the evidence from the whistleblower"
The "greenhouse effect" is inappropriate to begin with as a greenhouse has a solid roof that prevents heat from escaping via convection. The earth's atmosphere is open and so heat is not "trapped" but constantly convected upwards and away. Co2 makes up only .04% of the atmosphere. So the claim that an increase of one molecule in 10,000 from 3 molecules to 4 molecules in an open convective atmosphere can trap heat and has caused the 0.6C degree rise over the last 50 years is preposterous. When sunlight hits the earth the energy is converted to heat and radiated upwards in the longwave infrared wavelength bands. About 17% radiates out unobstructed. The rest is captured by mostly water vapour and Co2. But because of the structure of the molecules and the way they can bend or vibrate, Co2 can only capture the energy from a very narrow part of the total range of infrared wavelengths. This is the energy radiated from about -75 to -85 degrees centigrade which is not very much energy at all. Now, there is a limited amount of energy in this bandwidth available and CO2 at current levels already absorbs most or all of it. In fact,Co2 at 50ppm already absorbs most of it nevermind the current 400ppm. But here is the kicker! Water vapour absorbs across all of the wavelenths and overlaps the absorption band of CO2. And there is on average 50 times the amount of water vapour in the air. Water vapour alone has the capacity to absorb all of the infrared radiation. CO2 makes no difference. If you reduced it to zero, water vapour would absorb all of the radiation in the CO2 band, and whatever CO2 absorbs at whatever level in the atmosphere is simply stolen from water vapour. Cut it in half or double it, it makes no difference. And remember, there is a finite amount of energy in the wavelength that CO2 can absorb and it is all already being absorbed. 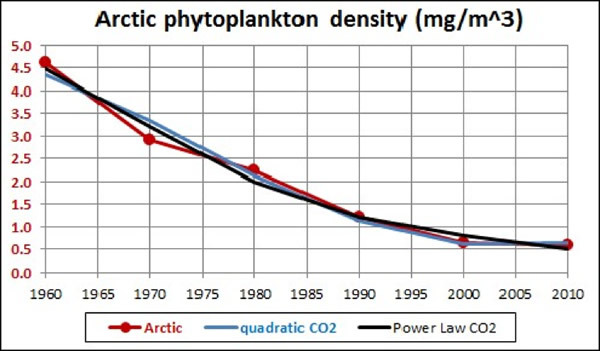 Increasing CO2 can make no difference. I always get a kick out of one hit wonders who come out of nowhere and make a whole series of posts thinking they're the man and they're going to expose this mass conspiracy amongst scientists and how we have all been misled. Well you know, old guy, some of us here also have pretty decent scientific backgrounds. And based on your above post (excuse me for being obtuse), you have demonstrated that you don't. The thing is, I'm a conspiracy theorist too and I'd be open to these arguments if they weren't blatantly flawed with just a little bit of understanding of the underlying physical principles. The Earth's heat is not "convected away" since space is a vacuum and there is zero convection there. Convection moves heat around the atmosphere but 100% of the heat that leaves the planet does so by thermal radiation, period. It is radiated from the ground and the atmosphere. It is radiated in all directions (including back down to the earth which is why cloudy nights are warm) and some of this infrared is absorbed by various substances in the atmopsphere which re-radiate the heat away again in all directions. This goes on and on and on, with statistically a percentage of that absorbed and re-radiated infrared eventually making its way back out to space. The result of all this is a lengthening of time for the radiation to make its way beyond the atmosphere out into space than would be the case in an atmosphere-less planet such as the moon, or in an atmosphere that did not have infared-absorbing gases. The greater the amount of "stuff" there is in the atmosphere which absorbs infrared radiation and re-radiates it, the more random back scatter radiation there is down towards the earth and the slower it is that heat escapes. This causes atmospheric warming. At its heart, the greenhouse effect is as simple as this and this name seems to be a decently accurate one; accurate enough to generally describe the process. I also always get a kick out of hearing the argument that CO2 only represents 0.04% of the atmosphere and therefore couldn't possibly have the strong effect we are told it does! How many times have I heard this... right then and there I lose respect for the poster because it's clear they're trying to mislead the reader and I can't be bothered to read on. On one hand, they'll play the "1 in 10,000 molecules" card from one corner of their mouth, but then the next thing they point out is how important water vapour is to the greenhouse effect... but there's only 5 times (not 50 as you suggest) more water vapour than CO2. So what happened to that "1 in 400 molecules" red herring, old guy? It doesn't apply to water vapour, only to CO2? First of all, the majority of the atmosphere; Nitrogen + Oxygen + Argon constitutes 99.7% of the atmosphere if you assume average 0.25% water vapour. N2, O2, and Ar have no infrared absorbing characteristics so they can be taken out of the equation. They are essentially irrelevant other than their convective effects. So now, instead of "1 molecule in 10,000" we're down to 1 in 7 molecules. Big jump, eh? It is true that most of the infrared trapping comes from water vapour and I don't recall any scientist suggesting otherwise. The issue is that a warmer atmosphere can hold more water vapour and therefore have greater warming capacity. This would tend to create a positive feedback runaway effect. But there are other negative feedback loops which would prevent this. But, any forcing that would tend to increase temperature a small amount can have an amplified reaction due to increasing water vapour. This is the positive feedback relationship that has always existed in the planet's history and explains why, even though the slow planetary wobbles that cause ice ages are gradual, the shifts in climate are not because critical thresholds are reached where the negative feedback effects are overrun by the positive ones; this is why certain GHG's which are not the dominant ones in the atmosphere, can tip the balance and cause such runaway effects. Of course heat is convected upwards as warm air rises to be repaced by cooler air descending and then that heat is radiated away at higher altitudes. No argument there. I never claimed that the molecules just dance their way out to space. And yes the energy is re-radiated in all directions. It bounces around between the radiative molecules at the speed of light but with an upward bias as the molecule density thins as you go up and thickens as you go down. The curvature of the earth also means that as you go higher the pathway out expands and it's not a 50/50 proposition. I will dispute that water vapour only makes up .25% as it is generally accepted to be between 1 and 2%. But yes, water vapour is so important because it can absorb the energy available in the band that CO2 can absorb, so between water vapour and CO2 they absorb all of that small amount of energy whether initially or on re-radiation. So that equation doesn't change. As for the oxygen and nitrogen molecules, how do you think they get rid of their heat which they acquired via conduction from contact at earth's surface or bumping into each other during constant convective motion. They give it up by collisions with water vapour which then rises and radiates it at higher altitudes or gives up its heat when condensing and precipitating out. Water vapour actually cools the air when the sun is shining. This is shown when at a similar latitude, the air is cooler where water vapour is higher than the dryer air over a desert. The water vapour acquires heat from collisions with oxygen and nitrogen and then rises and radiates that heat away. At night with no heat input from the sun magnifying convection the water vapour keeps the temps slightly warmer. As for the run-away greenhouse effect, initially from CO2 forcing and then from the increased water vapour, it is ridiculous on the face of it. First, because as just mentioned water vapour removes heat from the atmosphere. But mainly because if this were the case then temperature increase from any cause would initiate this feedback loop and this clearly hasn't happened during all the times the earth was hotter and sometimes much hotter.The warmists just made this up because they knew that they couldn't creditably claim that CO2 by itself could cause significant temperature increase. This is where the theory really falls off a cliff. I'd say the data is not on the warmists side as during the Holocene we have had significant temperature fluctuations while CO2 levels were stable. Water vapor varies by volume in the atmosphere from a trace to about 4%. Therefore, on average, only about 2 to 3% of the molecules in the air are water vapor molecules. The amount of water vapor in the air is small in extremely arid areas and in location where the temperatures are very low (i.e. polar regions, very cold weather). The volume of water vapor is about 4% in very warm and humid tropical air. I honestly don't know how much of an issue convection is. But water and lighter elements do dance off into space, and that does over billions of years change the water content of planets and asteroids. If it goes, it takes heat with it too. One of the big things about our magnetic field is that it keeps the solar wind from stripping the atmosphere... but it is sporadic, and to some extent stripping does happen continuously. Whether that is a practical consideration, who knows. It is, insofar as we want to colonize other planets: if you really want to do so, you'd probably either better have a fully enclosed system (at which point it is a fragile system that needs active defense against asteroids), or you'd better go ahead and crash a few asteroids into dead ones, to reawaken tectonics and get that molten core going. Then gas the whole thing up, seed it, and live on the surface as on Earth. My experience has been that most people who have an opinion on the climate issue have no idea what the actual facts are. You are so late to the party that you have no idea who I am, what side of the debate I may fall on, or how much effort I’ve invested in understanding this topic. You have not, to my knowledge, reviewed the extensive historic blogs on this topic at PP. Neither have you established, to my knowledge, any credentials here. I’m going to leave you to your misguided crusade, as I have better uses of my time. And fellow mortal. . . The podcast you posted was great, Daniel Schmachtenberger is brilliant! The following may not be of interest to this group, but I found it interesting and it has something to do with the water vapor comments. A few weeks ago I watched a presentation by some astrophysicists about how Venus and Earth became the way they are today and what the long-term future of both will be. I don’t remember all of the details, but the strength of Earth’s magnetic field, relative to that of Venus, is connected to it’s rapid rotation. Venus is hotter than it would be if it had a stronger magnetic field since its a solar wind sitting duck. Its proximity to the sun does not account for all of its high temperatures. However, in the very long term, the sun will become a red giant and earth’s water vapor will trap so much heat that it will actually be hotter than Venus. At least that's what the latest state of the art science is predicting. There’s nothing to worry about since we will have snuffed out all life on this planet long before. Peak Prosperity is my community. I stand with you in total agreement. Eloquent as usual. You know, whenever I read debates between those who support the science on climate change vs those who disagree with it, I wonder why it has to be so complicated. If there is no actual climate change, and we do nothing, we're fine. If there isn't climate change, and we act as if there is, we lose some money, time, and effort. If there is climate change - and the science as well as anecdotal evidence seems to support that - and we act on it, we might be ok. If there is climate change and we do nothing, we're fucked and are facing extinction. Option A, we look silly if we act. Option B, we - and much of the life on Earth - die, if we don't act. I mean, what more do we need to know? You have no idea how important not looking silly is. I mean, looking silly can be politically Fatal. Extinction ... well, at least it doesn't make a single guy look silly. And you wonder why extinction happens. better to be wrong about anthropogenic climate change and have lived as though it were true, than to have lived as though it were wrong and be...wrong. actually, Pascal was about deistic existence. Better to be a believer and be wrong, than a nonbeliever, and be wrong. Essentially there's a few groups in this debate I can think of, on one side you have GOP deniers that pollute regardless, then do gooder elites like Branson and celebrities who think there changing the world by encouraging people to fly more on slightly less polluting planes, then world leaders who are torn trying to constantly grow economies without making the link they typically need to emit more CO2 in doing so. Then the majority of the western world hoping a cheap technological miracle will allow us to transistion and allow us to continue enjoying our foreign holidays, iPads, abundance of meat and new cars. I've come to the conclusion we are all guilty to varying degrees, those that suffer the most will be the poor living in the most fragile of environments. I see more disasters as inevitable. Whilst not totally giving up hope, I'm happier recognising these as the good old days and trying to mitigate any likely changes in my own personal world and those dear to me, selfish yes, but ultimately more realistic. I read a couple of separate articles talking about trying to fly less and another about the Times publishing UKs highest tax payers. I was wondering if all our CO2 pollution was visible to everyone if that may change behaviour? Could a Blockchain solution track all our CO2 emissions and progressively tax us on them? That would highlight the worst offenders. Carl Segan once said that Earth's atmosphere is the thickness of a single coat of varnish on a classroom globe. By turn, double the number of humans are born by the hour globally than die. Since May 2011, there are 600 million more human mouths to feed, yet sixteen human generations ago there were but 500 million humans on the entire planet - at the time of Darwin sailing from Plymouth Harbour there were but a billion human beings. The human condition, amassing 6.6 billion extra mouths to feed in under 200 years. What is the point of this website if the meaning of the opening article has been lost through bickering? I say there is little point in arguing. The issues ahead of us are a moot point. You are all 90% in agreement with each other. You all have practically zero control over the future outcome. However, if you prepare better than most, you get to prove you were all correct. If you don't prepare at all, whatever the outcome, you all get to lick your lumps, whatever they may be. we like others to awaken, to see what is going on, take the red pil. I had mine a year ago, it is not a nice view, I undersatnd why people don't want to swallow the red pil, once you do it is impossible to 'return' to sleep! I did not read about Geo Engineering, weather modification in these posts. It seems the covernment is spraying metals in the admosphere like Aluminium, very toxic for all life. Very often called HAARP and Chemtrails etc. Global cooling is also a much seen topic in the independent media scene, (Adapt2030 and more). Scientific it is proven that we enter a grand solar minimum. In North America record cold are recorded right now. Most scary is the polar shift, it is accelerating. This will very probably mean that the protective shield around the earth will disappear in the near future, then we will have so much radiation most of the life/people could die from cancer. The elite/deepstate most probably know. 30+ trillion dollars are missing. Probably they are building under the ground and out in space to create rescue places for them selves, with our money, stolen during the past 100 years of central banking and accesive taxing. Over Christmas my niece was visiting for a while. She is a geophysicist specializing in this very topic. I asked her about the polar shift. She shrugged her shoulders and said probably not any time soon, but it is an outside possibility. But, even if it does happen it probably won't be that big a deal. Could Chris interview Greenhall &/or Schmachtenberger? Chris, could you interview Jordan Greenhall and/or Daniel Schmachtenberger? These guys are brilliant, and are applying their brilliance to the world problems in humble and enlightening ways. They seem to have a pragmatic, systems-thinking approach to resilience that is missing from many resilience/transition groups. They don't seem to be enmeshed in either utopian futuristic visioning or the gloom and doom individual prepping, but rather community problem solving and evolving as a species/culture to face a new reality. "When you go racing towards who can extract the dwindling resources fastest..., with the kinds of industrial technology that allow us to extract them so much faster than they can regenerate, that’s omni lose lose for everybody." So, we need a new system to replace our existing, competetive, lose-lose system. "a system that meets that criteria looks like no system of economics that we have ever had. It’s not Marxism, it’s not socialism, it’s not capitalism. It’s not a retrofit of any of those systems either"
I'd like to hear more from these guys. Some of us MIGHT make it through the bottleneck. It might not be me, but I'd like to do as much as I can to ensure that our collective conciousness continues in human form (needing food, water, shelter, community) during and after the "transition". I previously mentioned that in the ocean-atmosphere link that the oceans are the great reservoir of CO2. There is a constant cycling in and out of the oceans. The IPCC lied and said CO2 molecules remain in the atmosphere for centuries but this is comlpletely made up and unsupported. Multiple studies have shown that the average residence time of any CO2 molecule in the atmosphere is about 5 years. That means that the only residual amount in the air from human emmissions is from that emitted in the last 5 years. Only massive out-gassing from the oceans can keep CO2 amount in the air level or increase it. CO2 started out in the atmosphere at many thousands of parts per million and is now around 400ppm. Why didn't the oceans acidify when the Co2 levels were so much higher and being washed into the oceans with rainfall? The answer is sequestration. CO2 doesn't just make plants grow on land. In the oceans life depends on it as well. It starts with plankton and works its way through the food chain. When plankton and other life die they sink to the bottom and become imbedded in the mud of the seafloor.The same with the shells of clams and other shelled animals. After time and under pressure this sediment becomes transformed into rocks such as shale, sandstone, limestone. Thus the carbon has been sequestered. In places where there has been uplift you can see this in examples of what used to be ocean floor that is now rock on a mountainside. This sequestration has been taking CO2 out of the ocean- atmosphere system to the point that during the "little ice age" we were approaching starvation levels in the air and were approaching a life-extinction level. This process hasn't stopped and we need more CO2 and not less. Life on earth evolved at much higher levels of CO2 and is dependent on CO2. To call it a pollutant is simply wrong. That’s how you link a source by the way. A physicist? Seriously someone who is an expert in climate science. His views have been fairly widely criticized, even if he seems to garner peer support on his knowledge of physics. For the record, I wouldn’t trust Einstein on climate science either. A barbecue chef can’t tell the baker how to make a cake, even if they both are in the food industry. IMO, McPherson's predictions probably are too dire but not "wrong" -- we are f'd on climate, whether it's 5 years from now or 50. He's not the only one saying things are far worse than the IPCC concensus (= muzzled) reports -- worse enough that even going to zero carbon in the next 10 years would not avoid the feedback loops and tipping points (which mean unstoppable massive climate change). I'm sorry if this isn't clear, but I'm not going to go any deeper here. You can listen to McPherson's reviews of the science and decide for yourself. If you think he's unqualified, there are other analysts who have a better scientific pedegree who have come to similar conclusions -- "it's too late." That only means it's too late for preventative action on climate change. There are a million other things we can do to improve the biosphere that sustains us or that can improve the way we treat each other (and other species). You realize you are quoting a guy who hypothesized about extraterrestrial sentient beings constructing megastructures encompassing mini-stars which would sustain those beings while the sphere travels through space - ALL based on nothing more than conjecture - is criticizing climate scientists for relying too much on models? The reason I posted the Dyson quote is because people are fed the notion that people who disagree with the IPCC output are a just uneducated kooks. All of the things you have mentioned such as sea-ice melt have been refuted by people with expertise in the area. In fact, there is no sea-ice melt. Sea ice is currently within a fraction of its 30 year average and probably higher than in 1940. Warmists like to start their graph from 1979 because ice extent was high from a multi-year cold period. But military satellite images from prior to that show that the ice extent was lower than today. Greenland has been gaining ice mass in recent years and polar bear populations are robust and healthier than they have been in decades after over-hunting diminished them. But you would never know this by reading the newspaper reports put out by the propagandists which are manufactured nonsense. There is no such thing as a climate scientist. Climate research involves a number of disciplines with specialized knowledge. Nobody is an expert in all of the areas but a small group of activist scientists have put themselves forward as the authorities but in fact none of them are distinguished in any way or the best authorities in their areas. What they have done is created a small group involved in a process of pal-review which they call peer-review by which they try to exclude the opinions and works of people not part of their group. And they have the impimatur of the IPCC, the corrupt spawn of a corrupt United Nations which gives them their patina of credibility and authority. Honest scientists involved with the IPCC in the early years quit in disgust when political operatives manipulated the the official output that disregarded their conclusions and now all you have left at the IPCC are activist scientists or activists period and the political operatives.